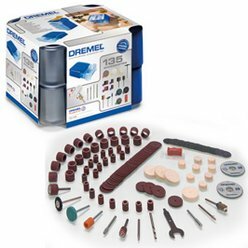 This 135 piece Multipurpose Dremel Accessory Set contains a wide range of the most popular genuine Dremel accessories (including EZ SpeedClic). The accessories are packed in two connectable storage cases. These modular storage cases can be connected to similar Dremel storage cases, to create and expand your own storage system.